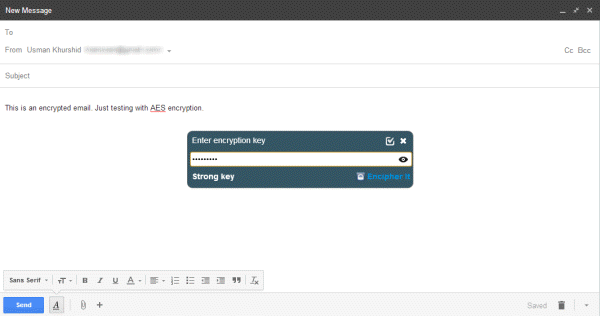 7 data encryption tools for added privacy and security.–PC Pitstop. Securing yourself and your data on the Internet is becoming harder all the time. The problem with most of the Internet services is that they tend to change their features and privacy policies so frequently that the user can’t keep pace with all the changes. We have already discussed ways to delete your personal data from the Internet. In this article, we will show you various tools that you can use to encrypt your data, be it emails, chat or even local data in your computer. If you are using web email services like Gmail, Outlook.com or Yahoo Mail, all your emails are already saved in encrypted format in the server. Nevertheless, it is good to double-encrypt important mails so that only you or the person who knows the decryption key can read the messages. 1. Go to Encipher.it help page and drag and drop the bookmarklet to your browser’s toolbar. Internet Explorer, Google Chrome and Firefox are supported and their variants should also work. 2. Go to your Email inbox and compose a new email. Once you are done composing the email, click the “Encipher.it” bookmarklet. 3. This will open a popup asking you to enter an encryption key. You can enter any password of your choice. 4. You will also be able to specify a lifespan for your email, after which, the email will be destroyed. 5. When the receipient receives the email, he will need to click the link inside the email which will then prompt him for the decryption key. If he has the key, he will be able to read the message. We always can find many file protection programs available in the market, such as compression programs. Depending on the file encryption software we can effectively reduce risks of data loss and data leak. I've used Kakasoft Folder Protector for nearly two years, it works well and encrypts fast.